Tina Turns the Country On! 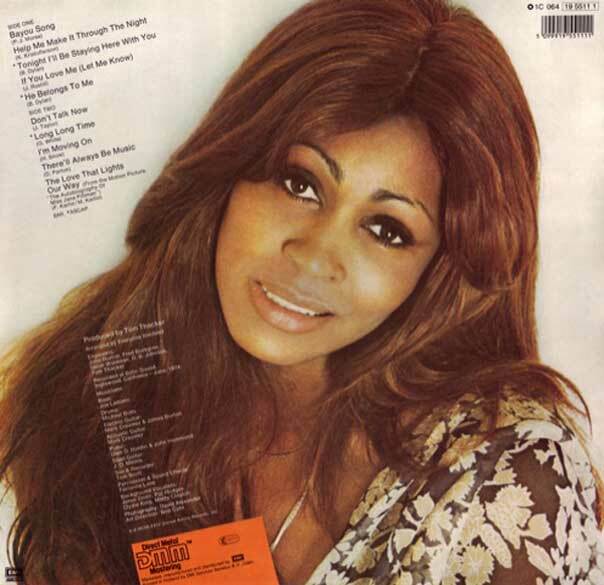 is the debut solo album by Tina Turner, released in 1974 on the United Artists label in the U.S. The album was recorded while Turner still was a member of the Ike & Tina Turner Revue. The album sees Turner - covering songs previously recorded by among others Kris Kristofferson, Bob Dylan, Olivia Newton-John, James Taylor and Dolly Parton. While it garnered her with a Grammy Nomination for Best R&B Vocal Performance, Female in 1974 it was not a commercial success and did not chart. Tina Turns the Country On! remains unreleased on CD. The album should not be confused with budget CD compilations such as Tina Turner Sings Country, Soul Deep, Country My Way, Good Hearted Woman, Country In My Soul, Stand By Your Man, Country Classics, You Ain't Woman Enough To Take My Man, The Country Side of Tina Turner etc. which feature material from the archives of Bolic Sound Studios. And for Christmas, buy him a dog. Where I've been, you don't know. And what I've got, baby, it don't show. Now, I won't try to teach you how, don't talk now. Don't talk roads, don't talk sand. Don't talk dust, don't talk no man. Don't talk rules, don't talk vows, don't talk now. and too many rights still make her wrong, baby. she can't make good what was bad before. No, It's too late now for me to lie and I can't make a second try. I just came on back baby got to say good bye, good bye. Don't talk now, don't talk now. Don't talk now, don't talk now. That's what somebody told me, but I don't know what it means. Sometimes I wonder Who knows the cause? 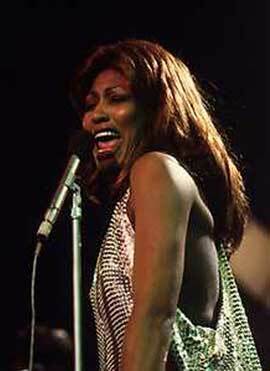 There is barely any debate among music critics and listeners wheather or not Tina Turner is an impeccable artist. She has a style that cannot be replicated and a legacy that is sealed into society’s consciousness. Find me one person that doesn’t know when to shake their head during "Proud Mary" and I’d be shocked. There is more music that often goes unnoticed from her career between being a solo superstar with the album Private Dancer and her tenure with the Ike and Tina Turner Review. Between the years of 1974, a year before she divorced Ike, and 1984, the year "What’s Love Got To Do With It" went number one, Tina recorded multiple albums to little success. The first of these albums was "Tina Turns The Country On!" This album finds Tina at her first solo experiment. When looking at music history and the history of Tina’s style, the choice to release an album of country and western covers does not seem like the obvious next step in her career. Yet this album speaks volumes of where Tina was at in 1974 and also widens her breadth as a vocal artist. This album comes right at the end of Ike and Tina Turner’s marriage. Their popularity had waned in the 70’s due to Ike’s frequent drug use, which resulted in missed and postponed shows. Tina was beginning to build her nerve through inspiration she had found through Buddhism which was the budding of her independence. That’s the diamond in the rough when it comes to Tina’s first solo album: independence. For the first time, she was given the most freedom on how she was going to conduct herself as a muscian. "Tina Turns The Country On!" is completely…country. Tina knows country because she was brought up in Tennessee, but I don’t think anybody was expecting her to sing it. Each song is a cover of a country hit with a new arrangement and that arrangement was…country. Tina Turner, the queen of rock and roll R&B, now had twang. I could see Tina doing a twist off of Ray Charles successes from his early 1960’s country themed albums, but I didn’t expect a performance I would have readily seen on The Wilburn Brothers Show or The Johnny Cash Show. I was expecting a blended mix of early R&B and country, but instead she fit in perfectly right next to Loretta Lynn. There are three levels of Tina within the album and with each level she becomes more…Tina. I call the first level "Mid-Tina." This level finds Tina singing with the roughness we have all grown to love, but mixed with smooth twang. We find this on the songs "Bayou Song, "If You Love Me Let Me Know," and "Don’t Talk Now." Next we venture into "Tina Turned Up." 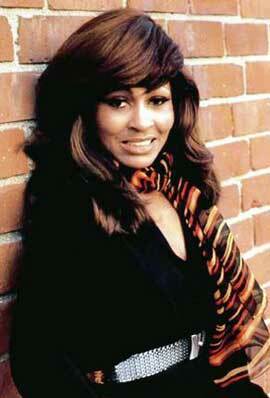 This is the Tina we generally find in her earlier recordings with Ike Turner. These elements are found in songs such as Bob Dylan’s "Tonight I’ll Be Staying Here With You" and Hank Snow’s "I’m Moving On." Lastly, we have "Tina Turned Down." In this level, Tina demonstrates her chops for delivering straightforward and easy masterpieces. This level contains all my favorite songs from this album. First she sings a vulnerable and rousing rendition of Kris Kristofferson’s "Help Me Make It Through The Night." Her voice is as smooth and liquid as melted butter. Her performance of this song finds her vocals in their most purest form. It is like they come from a child. Then there is the hopeful Dolly Parton cover "There’ll Always Be Music." I could easily see a choir erupting behind Tina at any moment during this recording. Her genuine love of unadulterated music is on complete view. She then closes out the album with "The Love That Light’s Our Way." This song eludes to the concrete truth that love will always prevail and lead the way, a sentiment that was muddled for Tina at this time. Her vocals in this song will convince anybody, that truth and love always prevails, something she still believed deep down. This album begins to encapsulate the independent artistry of Tina Turner. It shows that she was not only a musical interpreter that crossed genres, but one that can reach the furthest of human emotions in the same fell swoop. She takes country music, flips it on its head, reconstructs it, and sings it her way, but she was still under a jail cell. Her later solo efforts were to be completely independent of Ike Turner in all regards. This album shows that all you need sometimes is to let someone shake their own tail-feather and to never restrict someone to be a private dancer. This artistry within Tina was nearly untapped and it was time for the world to hear it. It was time for Tina to be Tina.